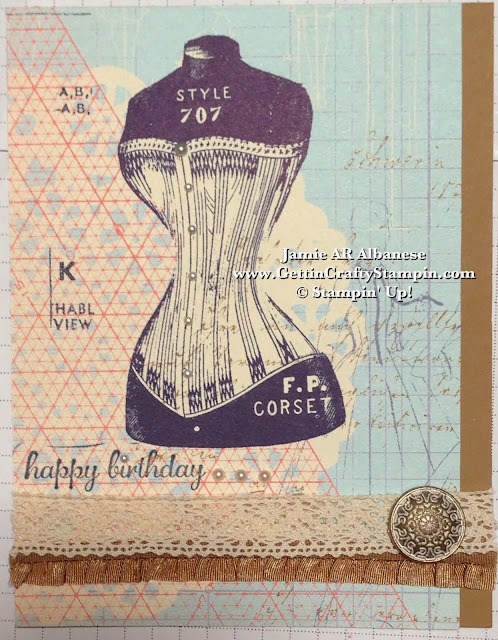 Celebrate with style... creating this card was such fun! I knew when our Zia was celebrating her 65th birthday that I had to create vintage elegance... and I think this card achieves it! A quick card that says so much and personalized to her style to show we care! What do YOU think?? Leave me a comment and let me know. Share me and this with your friends and family, Pin, Email, Facebook, Tweet, Google+ and Follow Me on these avenues, YouTube, Instagram and more, too! Starting with the Etcetera Designer Series Paper (#130129) as this page really is oh so lovely and feminine.. just like our beloved Zia Antoinette! Stamping this Happy Birthday in Midnight Muse ink (#126860) from the Hostess Exclusive* Express Yourself stamp set (#130339). *Join me and earn these awesome hostess benefits while creating cards with your friends and family in a Private Class!! Earn Free and 1/2 Price Items - YAY! 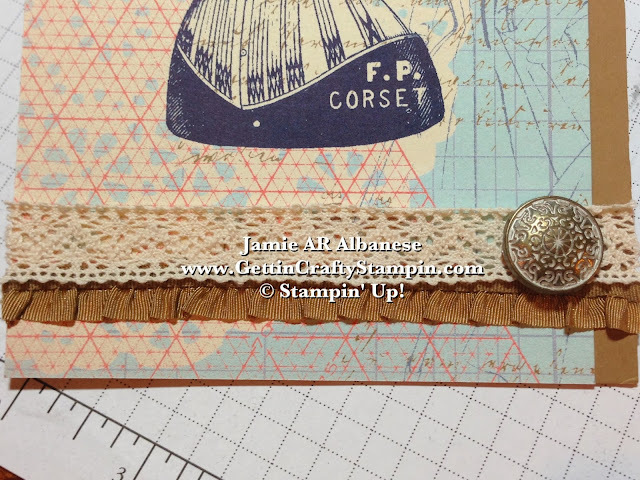 Embellishing this corset and doily patterned vintage looking paper was fun to do! Our adhesive backed Pearls Basic Jewels (#119247) add luxury and richness.. and elegance! Using our Sticky Strip adhesive (#104294) an ultra strong adhesive.. it holds this 3/8" Baked Brown Sugar Ruffled Strech Trim (#130022) and layered the 5/8" Victoria Crochet Trim. Buttoned up with the Antique Brad (#117273) for a lovely embellishment. Here is Zia and her beloved children.. we are so blessed to be related to them and to count them as god parents to our kids and friends!! I love when you actually like your family! Wrapped up, oh so pretty! 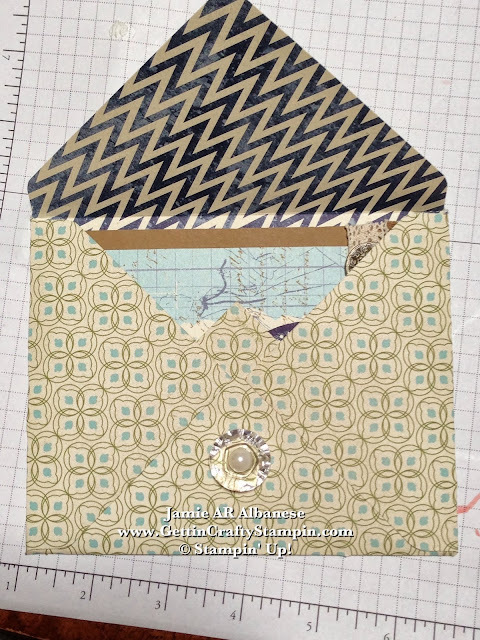 Taking the new Envelope Punch Board (#133774) and a piece of the Etcetera Designer Series Paper, I created this elegant and vintage envelope to place this card in! I created this as my hubby tapped his foot, we had to goooo to the party! Even heeee was impressed with the beauty of the envelope and the ease and speed of the creating it!! Buttoned up... 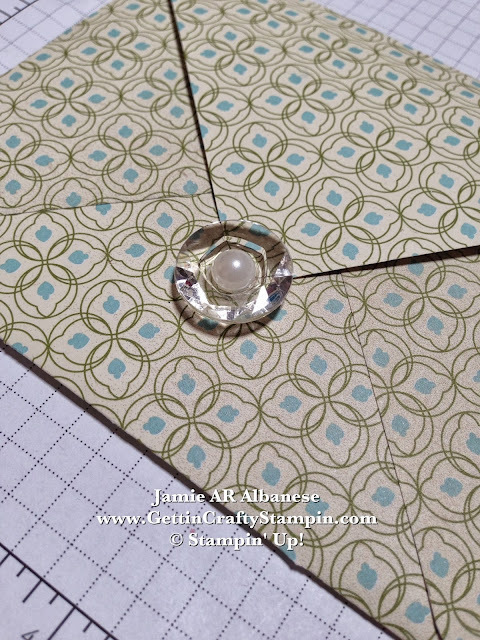 I like to use fun embellishments to button up these envelopes!! Here the Vintage Faceted Designer Buttons (#127555) that create a beautiful crystal look.. the Sticky Strip adhesive holds that down. I adhesive the bottom half of the back of the button.. leaving a lip to tuck the flap under! Adding the Large Pearl (#125577) to the center adds even more elegance and accents the feminine quality to the card! Our Designer Series Papers are DOUBLE SIDED!! YAY!! So it comes with an automatic 'lined' look!! 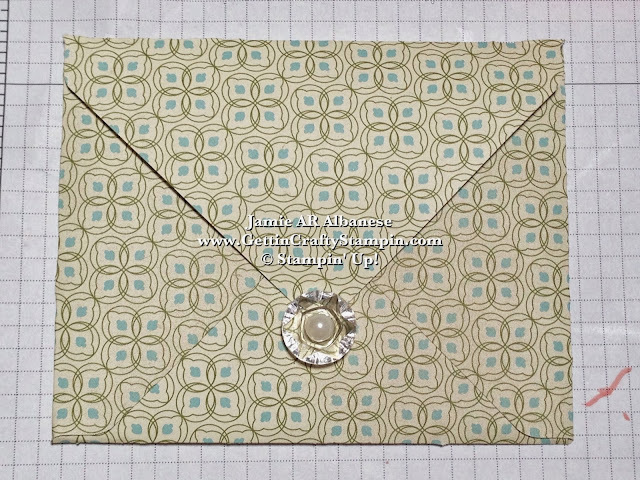 Tucked in, this envelope announces the pretty fun inside... and coordinates with the card for a WOW look! OK doesn't it make you get a little excited when the wrapping is so lovely?? It makes me more excited to open a present or card! Here my youngest girls and I enjoy a snuggle with our pasta, cheeses and vino... we loved watching the kids play with their cousins and have fun! 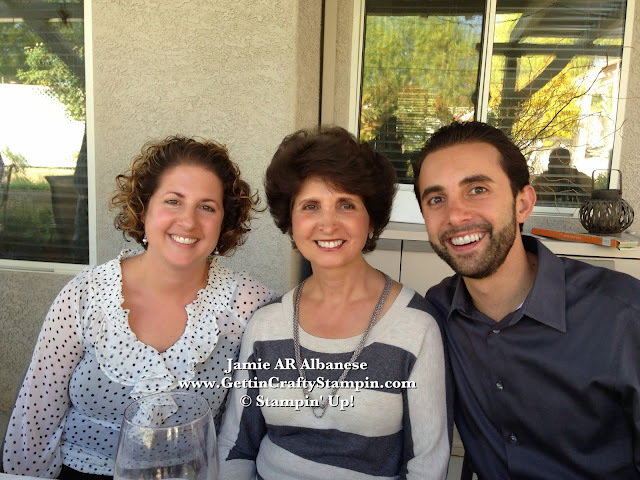 Visiting with your family elders, the kids finding fun moments with their Uncles and Aunts... family can be such a blessing! Buttoned up, lace, ruffles, pearls.. With a variety of pearl sizes, textures and colors.. you can create a fun and unique project!! Open it up to see the fun accent I placed inside!! 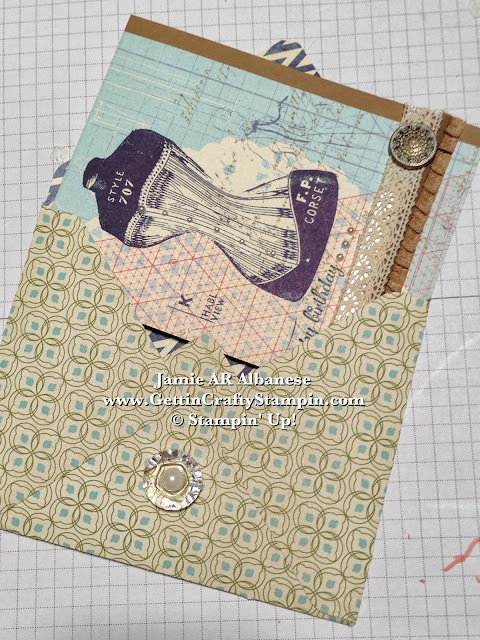 This card coordinates with her Vintage Dry Erase Board gift... and I used the 'scraps' from the doily that I 'aged' on the inside of this card!! 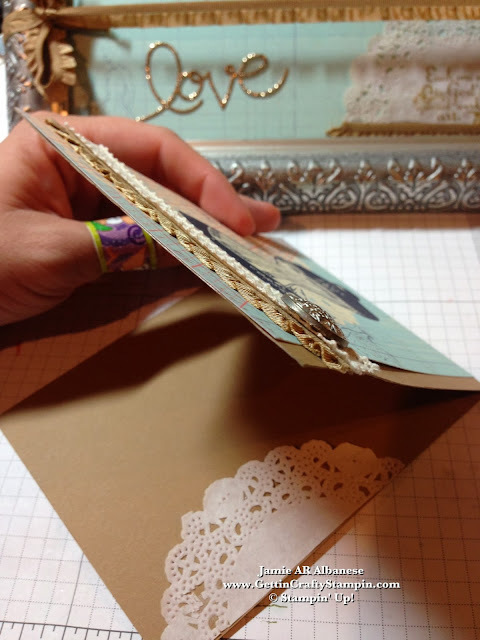 Adding something inside a card is easy to do and sure to WOW (four people commented just on that accent!). I'm glad that you came by today! Visit often, I try to post daily... bring your friends and family along, too!! 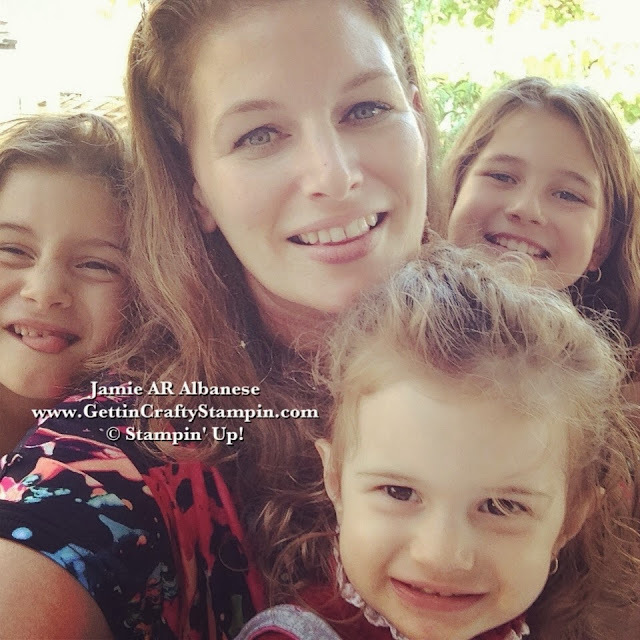 Grab a pretty paper or accessory that speaks to you and join me in the paper crafting fun. Celebrate those you love with a personalized card that is sure to WOW! Nothing is more precious than someone actually knowing you and your style! This card was fun and fast to create while leaving a long lasting impression of love!! I hope that YOU have fun creating something special for someone in your life!